Universities gearing up to welcome students in a few weeks' time are bracing themselves for a potentially more daunting onslaught: "helicopter parents". It is a phenomenon that has long being associated with American colleges but many British administrators say they are witnessing a similar development. A new generation of over-involved parents hover over their offspring - flooding campus orientation sessions, interfering in registration, meddling with lecturers, administrators and potential room-mates. Administrators say pushy parents are now involved in all aspects of university life, from traditional concerns about housing, safety and welfare rights through the admissions process to questions over qualifications. A growing number of universities are assigning welfare staff or forming entirely new departments aimed at helping parents. Parents distraught at the prospect of leaving their offspring at university for the first time will find the blow of an "empty nest syndrome" softened somewhat by a service at Leicester University. Welfare staff will be on hand as parents drop off their children, providing expert reassurance - for the parents. Parents will also be asked to sign up for a family programme - allowing them to keep in touch with the university, take part in events and be informed of the latest developments. Clare Taylor has 20 years experience in higher education and is the head of student welfare at Leicester University. She says the relationship between parents and university is changing. "As parents are now financially involved in higher education they want more say in what is going on. "Some parents see children going to university as a continuation of secondary school." The admissions officer at Sussex University, Robert Evans, said parents now wanted to know more about quality and degree content and often asked whether their children were actually bothering to do any work or turn up at lectures. "Some even try to appeal on behalf of their children over their degree classifications," he said. "In fact such is the demand that we now run some of our post-offer open days at the weekend so that it is easier for parents to attend, and many of our faculties also put on special events for parents. "Long gone are the days when most students travelled to the university on their own or simply got dropped off by mum and dad who will then go off to Brighton for the day." Administrators warn there are limits to the information they can provide, due to the Data Protection Act. They tell parents to recognise that their children are adults who in many cases are well aware of their responsibilities. But they agree that parents will have more say in higher education in the coming years. Some institutions are training parents on how to let go and say parents can have a better understanding of university life by becoming students themselves. Huddersfield University now has a family liaison officer on its payroll, and it is thought to be the first in the country to respond to the issue in this manner. "As access to higher education increases my hope is that one future role of parents in some cases is to become students themselves, either for the first time or further study," said the university's director of student services, Rev Paul Wilcock. "We have several instances of students coming to Huddersfield and enjoying the course so much their enthusiasm encouraged their parents to sign up." Education expert Prof Miriam E David's research at London University's Institute of Education highlighted the increasing role of mothers in selecting their children's university. She blames the helicopter parenting trend on government policies towards education and other public services. "The government's policies have changed and universities have expanded," she said. "These factors have introduced markets, audits and privatisation into education and other policies such as social services mean that parents and students are expected to behave more like consumers of a service than as clients or professionals." 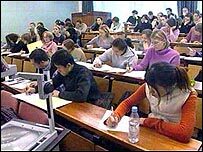 A spokesman for the Department of Education and Skills said: "At a time of considerable change in the higher education sector, students will want to know that the investment they are making represents the best value for their money and this knowledge will put them in a strong position to bring about further improvements in colleges and universities."